All season Lucky Whitehead has been close to returning a punt for a touchdown but he never quite took it to the distance. Yesterday that all changed. With the game tied at seven midway through the first quarter, Whitehead received a punt from his own 27 yard line and sprinted past ODU defenders for a 73 yard touchdown. At the ten yard line, Whitehead was joined with a catalyst of blockers making sure he was able to reach the paydirt. “It feels great to finally put it all together,” said Whitehead. “Before the game and all week during practice, I was telling my boys I wasn’t fair catching no matter what.” Hailing Manassas, Virginia, Whitehead came very close to choosing to stay home and play for ODU rather than play for the Owls. “Before I came down that was my last visit before I visited FAU,” said Whitehead who grew up with some of ODU’s players. “So I knew the coaches, and after the game the coach actually said ‘Did you have to run that back on me,’ so it was a good feeling. Whitehead will finish the season sixth in the FBS in total punt return yards with 311, and fourth in the FBS in average yards per punt return with 16.4. Coming into the season senior Andrae Kirk was the key cog in the front seven Owl fans could rely on. Kirk made big hits in front of the line of scrimmage, behind the line of scrimmage, and even added a few interceptions during his senior year. Kirik finished the season with two sacks, two interceptions, one forced fumble and 102 tackles. Those 102 tackles will put Kirk second in FAU history in tackles for a career. “Its a great privilege to be that high,” said Kirk. Kirk led all Owls with 12 tackles against ODU. FAU displayed flashes all season of a team that was on the verge of turning the corner but could never get over the hump. 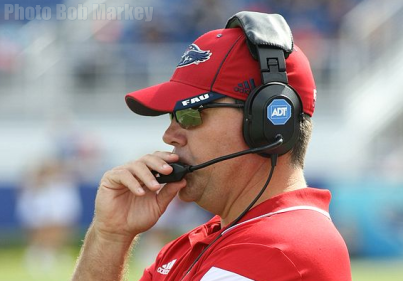 After an 0-2 start, FAU torched Tulsa for a 50-21 win. After a heartbreaking loss to Wyoming, FAU bounced back the following week for a game winning touchdown to defeat UTSA 41-37. After losing to ODU 31-28 yesterday FAU will finish the season 2-4 in one possession games. That’s the margin of error for a program that is learning how to win. Slim. With another season gone without a bowl game, all FAU can do now is wonder what the season would have been like if they finished games. FAU Stadium has been accustomed to seeing football legends on the sideline. Howard Schnellenberger and Bobby Bowden have graced the stadium with their presence at some point and now you can add one more to the list. Yesterday Don Shula provided the pregame talk to the Owls before coming out to the field. “It was pretty cool,” said Whitehead. “I enjoyed listening to his speech, but he didn’t give a fired up type of speech,” said Whitehead while laughing. “To see Howard Schnellenberger and Don Shula next to each other is pretty humbling company,” said Partridge. Don Shula’s grandson is Wide Receivers and assistant coach Dan Shula. Don Shula is in the NFL Hall of Fame and is a two-time Super Bowl Champion head coach of the Miami Dolphins and currently holds the NFL record with most career wins with 347. 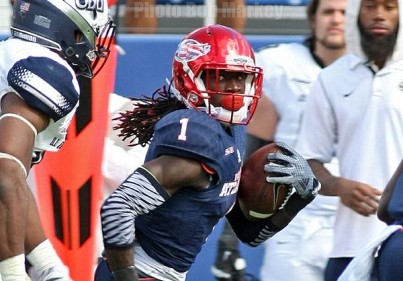 - Lucky Whitehead’s punt return for a touchdown was FAU’s first since 2001. - Jaquez Johnson threw zero touchdowns in a game for the third time this year. - All three have been losses. - Kalib Woods led the team in receiving yards with 54 on two receptions. - Whitehead led the team in receptions with three for 28 yards. - FAU finished the season 3-2 at home, the same as last year. - The owls will finish the season on a five game losing streak.